Let’s get practical for a moment. You’ve heard about the importance of courage and vulnerability in taking your relationship to the next level. How do you do that in a way that actually makes you stronger? How do you truly overcome feeling like a victim – in your life and relationship? How can you literally become a “yes” to everything – the painful moments as well as the joyful moments – to create new levels of spark and connection in your relationship? 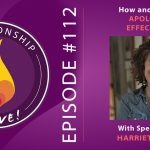 In today’s episode, you’re going to learn a way of showing up that helps you face your fears and heal the patterns that no longer serve you, no matter what’s going on in your relationship. 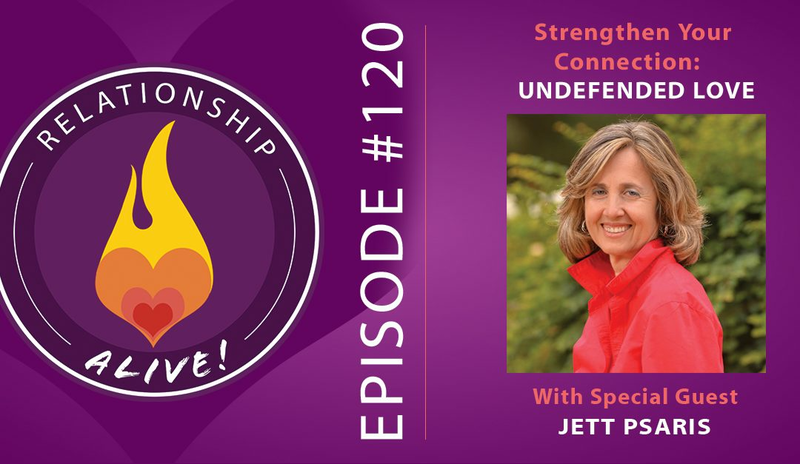 Our guest is Jett Psaris, co-author of the book Undefended Love, and her work clearly illuminates the path to wholeness, healing, and deep authenticity – especially in relationship. 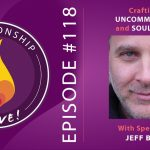 I’ve been excited to speak with Jett Psaris ever since the beginning days of the Relationship Alive podcast – and it was well worth the wait. Plus as an added bonus, you’ll get to hear us sing the “Namaste” chant together at the end of our conversation! Click here to receive the Jett Psaris and Undefended Love Transcript! 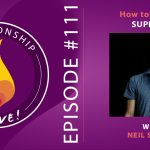 Neil Sattin: Well, on today’s show, we are going to dive deep into the black hole of transformation with Jett Psaris, who is one of the co-authors along with Marlena Lyons of the book, “Undefended Love”. This book will truly open your eyes as to what is possible. Not only in partnership but also in how you reveal to yourself the ways that you are holding yourself back from being centered in your essence and operating from there. And also, how to bring that kind of clarity into your partnership and to see ways that you can stop defending yourself and instead be undefended, vulnerable, courageous and alive. So with that, we will dive right in. I do want to let you know that we will have a detailed transcript and an action guide for this episode, which you can get by visiting neilsattin.com/undefended. And you can always text the word “Passion” to the number 33444 and follow the instructions to also get a link to this show guide and all the other show guides from Relationship Alive. Neil Sattin: Great. And it’s my pleasure. And just so you know, listening, this is a conversation that actually started a couple of years ago because I knew very early on in the inception of this podcast that I was really hoping to have either Jett or Marlena here on the show to talk about “Undefended Love”. So with a little patience and waiting for the timing to feel right, here we are. Neil Sattin: I’m excited. And Jett, I’m wondering if we can start right out by talking about this concept of… We’re talking about undefended love, but what is defended love? What is being defended and what are we defending ourselves from? Maybe that’s a good place to dive in. Jett Psaris: Yeah, in fact, yes it is. The reason we titled the book “Undefended Love”, is really because most people, while they’re aware of defensive behaviors and actions like reactions, getting angry, withdrawing, most people are aware that those are defensive but unaware that our entire perspective is born out of a defense. For example, if our orientation or role or sense of self that we adopted as a child was to be super competent, that itself is a defense against feeling not good enough. And so, while we can catch ourselves in defensive behaviors or being triggered or reactive, we seldom know that we’re going through each moment of every day oriented around protecting ourselves from an experience we had as children that we could not endure. And so, I often point out that these roles that we play and ways of perspectives that we have taken on, they actually got us to this place in our lives. They helped us survive. But now, if we don’t relinquish those roles, self-concepts, worldviews, and emotional coping mechanisms, we don’t relinquish them – then it’s a little bit like an acorn husk, if it doesn’t give way, the seed possibility for who we can be, ourselves and in relationship, will never be realized. So undefended, undefended love, is the work of recognizing and dismantling those defense structures which will then dismantle, and the defensive reactions and behaviors will no longer be necessary. And I love the way you did this introduction, it was very subtle, but I want to point it out to listeners. The introduction that you gave, Neil, is you very subtly wove in that the starting place is with ourselves. The starting place is not getting the other to be different. The starting place is that relationship and love call us to a profound inner transformation. After which, we can relate to others in an undefended, or in a non-provisional way. So that’s our starting point. Neil Sattin: So many places that we can go from there. I’m curious… Well actually, maybe a good place to go from here is… A lot of people were asking me, “What can you tell me about ‘Undefended Love’?” They were like, “What are you reading now for your upcoming interview?” And I was like, “Alright, well basically, when you’re growing up, things happen that lead you to form erroneous conclusions about yourself which you call the cracked identity.” And it’s this sense, and it can be distilled often down to simple statements like, I’m not lovable, or, I’m not worthy, or I’m not valuable, or I’m always wrong. I think those identities, they’re not things that are there all the time for us, but from that come our personalities. And one thing that I loved about what you wrote about was how you showed that the personality – things like being a really generous person – are actually there to help us avoid feeling the pain of this underlying cracked identity. Jett Psaris: And so, you see the impulse is to maintain the relationship. But the way we maintain that, psychologically, produces a self-concept that we just build on over, and over, and over again. And maybe later in the show, we’ll talk about how we do that in partnership, how we maintain that entire mistake. Neil Sattin: Yeah. And with that, I thought another great example that you offer in the book is just because you might be listening and thinking, “Well I’m not shut down. I’m a really generous, giving person, full of exuberance. So this probably doesn’t apply to me.” So what would you say to that person? Jett Psaris: And so, that’s where we begin to see that. We’re not actually working purely with essential generosity here. But I want to hasten to mention that we cannot develop a concept of generosity unless we have that essential quality. So the truth is, he does have that essential quality and it’s apparent if you sit with him for a number of minutes, you can see that he has that essential quality, but especially with his wife, it also has become a compensatory identity. That has become an obstacle in their relationship because he is more focused on being seen as generous than making authentic contact in a given moment. I just want to mention one more thing about this just coming to me, I’m sorry to interrupt you. Jett Psaris: Is that the other thing about this is that when he is giving to his wife and she receives that, it’s actually not enough. So there’s a little backside here, it’s a nuance, but he is more attached to a constant stream of validation, and if that stream is broken, then we begin to see the cracked identity underneath that compensation. Neil Sattin: Yeah. Can you chat a little about how that compensatory identity, so you’d think, “Okay, I’m great. I suffered under my parents. I became… I learned how to hold myself back a little bit”, or “I learned how to be really generous.” But at the same time, these compensatory strategies, they actually perpetuate that underlying belief as well. Jett Psaris: That’s exactly right. It’s very rarely understood that if our emotional survival strategy is to seek approval, every time we seek approval, we reinforce our deficient identity as not good enough, or not smart enough, or not generous enough. So it’s like we’re putting coats and coats of paint on that deficient identity and we keep… It’s a little bit like an addiction. We keep having to fill that hole, H-O-L-E of deficit. “I’m not good enough so I need to constantly hear from you and everyone around you that in fact I am.” So it actually does the opposite. The approval just gets us by for that moment, but it never is going to fill that hole. 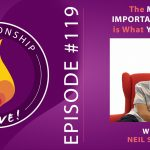 Neil Sattin: Yeah, and so let’s make the leap, at least in this moment that the way that we typically find ourselves in relationship is driven by some aspect of this personality, the compensatory strategy. Jett Psaris: That’s right. That’s right. A good question and if we take this into a little bit more concrete example is, if you ask yourself, what experience am I trying to get in this moment with my partner, or what experience am I trying to avoid in this moment with my partner? Then you will begin to see the workings of the compensatory and the cracked identity, because authentic and essential interactions are never trying to get something and they’re never trying to avoid something. Neil Sattin: So yeah, so now I’m wondering, and you’re probably wondering if you’re listening, where we’re headed with all of this ’cause alright, great, you’ve got this, I have these cracks in my identity and then my personality came up and there are things about it that are great and maybe there are things about it that are not so great. If I’m gonna be delaminating all of these coats of paint that Jett was just talking about, where do I get with that? What possibilities actually open up for me if I’m willing to go through this process? Jett Psaris: Well, the one piece is that we through this process, we develop ourselves into a much larger, we become much larger. And I often use this example of, if you picture a glass of water next to a large pristine blue mountain lake, and where we start this journey really as that glass of water. So if you picture putting maybe a teaspoon of salt into that glass of water and drinking it up, you’ll be repulsed. But that same teaspoon of water into that blue mountain lake, that water is just going to be as refreshing as it always was. Jett Psaris: So life delivers us and also of course relationship on a daily basis, things that don’t taste good. If we’re that glass of water, we’re gonna constantly be saying “no” to everything that comes toward us that we believe is going to produce discomfort and displeasure. But as we become that large, blue pristine mountain lake of our beings, all the things that come to us, they become absorbed and refreshed. And we actually become a source of nourishment and refreshment to everyone around us. Jett Psaris: You can see this a little bit with people who have gone through cancer a number of times. The first time they get the diagnosis, they panic, usually reach for whatever treatment is offered, and go into kind of a trance state and just try to survive. The second time, well, they have their medical team together, they know what worked and didn’t work. They move a lot more slowly, generally speaking. And they have the ability to recognize that life is continuing, and this recurrence has also come into their lives. But they have much more stamina and capacity to show up for what’s happening. Jett Psaris: And the third time, they’ll come into my office, and then say, “Well, there’s been a third recurrence, and I feel capable of taking the necessary steps, and I also want to talk about what’s happening currently in my marriage.” And so, the capacity to be with what life offers becomes larger and larger. We’re less likely to feel resentment, we’re less likely to feel collapse, we’re less likely to feel emotionally defensive or reactive. We develop a general “yes” to everything, because we are so large and have already experienced our capacity to show up for life, that we’re no longer afraid of life, as we are when we begin this journey. Jett Psaris: Everyone knows what it feels like to have these essential qualities bubbling up in them. And I often use the example of the first time you fell in love. And if you can remember that, the first time you fell in love, a lot of us will focus on what the other person was like. But if you focus for a moment on what you felt like, that experience of yourself, when you first fell in love, that openness, that joy, that capacity, that willingness, that love and all of that, that’s actually the destination of this journey. When we fall in love we glimpse that possibility for who we can be with another, and within ourselves we glimpse that possibility. And then, the hard work of realizing that possibility begins. And so, in short form, the answer to your question is, who you were when you first fell in love, the experience you had of yourself, that’s actually the destination of this journey. Neil Sattin: That would make sense. And it’s making sense to me on this deep level of, right, of course, I’ve been summoned by this vision of potential. And then, I think often couples find themselves heeding the call, being summoned and then a year or two or 10 later, totally forgetting what called them into that relationship to begin with. Neil Sattin: So what happens when we get stuck? And as I did mention in the intro, which you heard, Jett. A lot of what we’ve talked about on the show has been about creating safety in relationships, so that people really feel freedom to be vulnerable, to be courageous. And yet, I couldn’t help but notice that further along in your book you talk about “REACT”, and basically identifying all of these qualities of a safe container. And talking about, how maybe those are great to get you to one place, but then you have to find ways to shed those qualities. Jett Psaris: And also, “In the presence of your criticism, what essential quality or aspect of being do I lose access to?” And clearly, that would be curiosity. So in order to have a fidelity to our own unfolding, we have to say, “Okay, in this moment in the face of your criticism, I have lost access to my essential curiosity. And so now, what I want to do is I want to try to access that curiosity and apply it to your criticism,” and then you’ll notice that the whole relationship moment, the tension will soften because you’re willing to listen to what your partner has said even if your partner has said it in a way that is not simple. Jett Psaris: Well, the truth is you don’t avoid that, you don’t avoid anything in this approach. And what you do is you establish this fidelity to your own unfolding, and that’s primary. And then, what actually happens is one of two things, you outgrow your partner and that becomes very evident and then the question is of whether I should leave or not really becomes moot, becomes obvious, or your partner sees who you’re becoming and jumps on board. And I can tell you that happens more than… The latter happens more than the former. The experience they have of your openness, your clarity, your kindness, your skillful means, they begin to say, “I want to be more like that. I want to find that in myself. I want to join with you in this enterprise that you have initiated.” And I can tell you when that happens, often the turn is quite dramatic, and then you have established a new chapter on your ground between you based in the shared value of being allies, intimate allies in this journey. Jett Psaris: But it is true that there are those who resist and defend and say, “You know, I don’t want to do this work.” And then the person who is doing the work, they become stronger, clearer and then they have a choice. Do I want to stay with you and accept you 100% as you are? And then of course, they also have developed the abilities to set boundaries and the rest of that, or is this really no longer… Has this taken us where we could go together, and do I want to actually step outside of this relationship now and move forward on my own? And that’s a scary place for people. But it’s a lot scarier not to take the journey because if you don’t take the journey that seed acorn of you will wither and die. Jett Psaris: We all die anyway. It’s a series of deaths. Of course, this is a totally transformational process, we get very good at dying psychologically and emotionally speaking, over and over again, that’s we become part of the cycle of life, and that’s why I think we all long for intimacy so much because it’s so fresh, it’s so new, it’s so exciting, there’s no longer, been there, done that, everything becomes sacred. And that’s when I think life really becomes everything that we’ve read about. Neil Sattin: So what does the process look like? And I think this would be good to complete our overview of what someone’s gonna go through and then maybe we can offer some actual beginning steps for you, listening, so that you can get a sense of how to take this journey. Jett Psaris: The second one is to stop critiquing. Stop that outward flow and that is very important. The next task is to recognize that there’s more to you in that moment than you think. So whatever you think is going on, there’s a lot more going on than that. And so, your work is to inquire into the experience you’re trying to get in that moment and the experience you’re trying to avoid in that moment. Once you do that, it will bring you naturally down into whatever the contraction is that is keeping the self-concept in place. So I’ll use an an example. So if you come in… Oh actually can I use you as an example? Neil Sattin: Sure. Let’s go for it. Neil Sattin: Yeah, sure. Let’s go with, I’m working and I’m working a lot and, I get a complaint from her that that I’m working too much and I haven’t prioritized our connection enough. Neil Sattin: Let’s say in that day even. Jett Psaris: Yes. And let’s say in that moment, you’re not in your most conscious and spacious self who would probably say, “Oh, you know, I hear that you are wanting more time with me,” right? So in our most conscious self that’s what we would say. But let say that you’re actually working really hard and you’re trying to get somewhere, accomplish something, and so this interruption actually threatens what you’re trying to accomplish. What’s the first thing you experience was the reactive experience when she interrupts you with her complaint? Neil Sattin: That she doesn’t value what I’m doing. Neil Sattin: Well, it’s a pattern that certainly came up in other relationships that I had before. And I think it connects me… In this moment, I’m seeing my parents very clearly and thinking about how I had to justify my choices to them. Yeah, things that were interesting to me that I wanted to pursue that they didn’t necessarily approve of. So, in those moments I would feel like they didn’t value what I was doing. I had to do something different to get their approval. Jett Psaris: Right. So in that moment when she has that complaint, it brings you back to an old area of sensitivity that who you are and the choices you make are not valuable. So, in that moment, you lose access to your intrinsic value which is your essential trait and you experience the part of you that wants to make his own choices, but also his choices in some way threaten the stream of goodwill and approval from the other, whoever that is, parents or your wife. And so in that moment, if you don’t become reactive and push against her complaint, you don’t value me with your own complaint, that’s how we separate from each other. If you were to use her complaint as an invitation to drop back in your history to the young boy who had passions and desires that were disapproved of, what vulnerable experience would you have there? What was the vulnerable experience of that young boy? 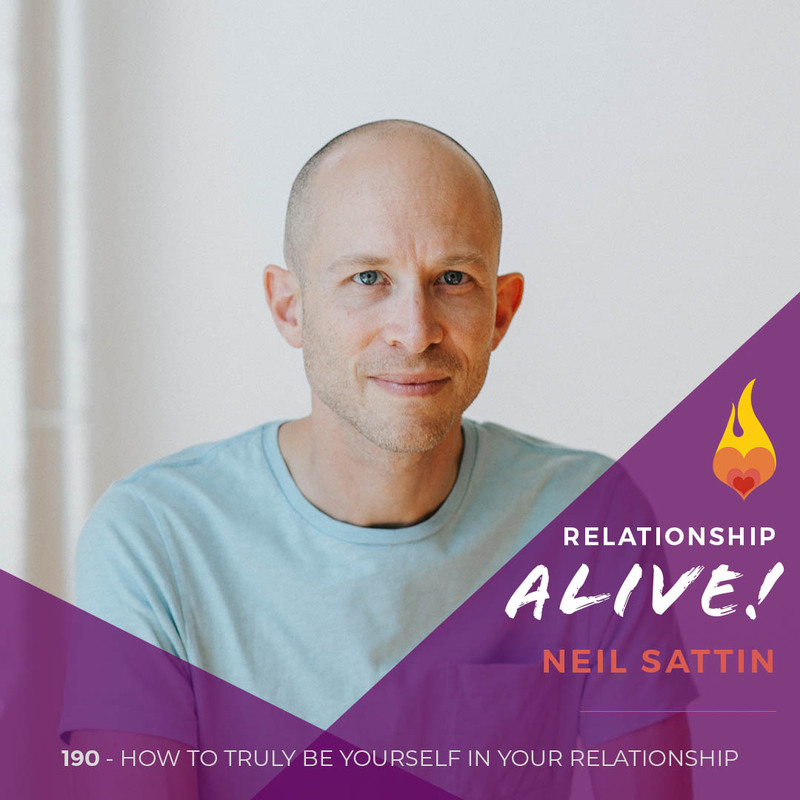 Neil Sattin: He felt alone and self doubt comes up for me. Yeah, like maybe I… Yeah, a lot of uncertainty and confusion almost, like if I can’t… I guess, I can’t trust myself. Jett Psaris: It would be great if she could say that, but it’s equally important that she can’t because you need to develop the ability to stay in contact with yourself without defending against what she says, and to stay in contact with yourself and also it will bring you to deeper contact with her because she said, “You know, I hear what you’re really saying is you miss me. And that is actually what I wanted in the beginning.” And so, then the two of you can be allies, “You know, I hear that you miss me and actually now that you’re saying that, you’ve kinda jogged me out of this addiction to my work. And let me just finish this up and let’s spend some time together.” Or you’ll say, “I miss you too, but this is a priority for our family. And so can we kinda support me around completing this project, and then let’s plan some extended time together so that we make sure that we’re also nourishing the well of our relationship.” So then you become resourced. 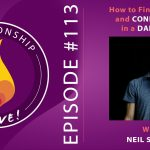 Neil Sattin: How helpful is it to, when going through that inquiry, to let my partner know that that’s… Like to let them know what I’m going through or what I’m experiencing, what I’m seeing? Jett Psaris: Well, if you have the emotional strength to reveal your process and there is a welcoming environment to do that, I would say do that. If it feels too risky, then I suggest that clients say to their partner, “Listen, something’s just come up for me. I just feel triggered in this moment. It’s not about you. I’m gonna spend the next hour to diving in into that and can we meet up at [3:00], so that I can reveal that to you and we can talk about it.” It is very important to let your partner know that you’re in process. And if you don’t have the strength to reveal that process or that process needs some incubation time to protect its space. But you maintain the relationship with a promise to do your work and come back into discussion about what just transpired. That is very important. Neil Sattin: And just to be clear, the process of diving in, there wasn’t some magical mantra around the experience that I was having. It’s more about simply being with that experience to get to the other side. Jett Psaris: Yes. It’s well said, first of all, I just want to also appreciate, I mean how many… Just to, this is a note to the listeners, how many podcasters you know who willing to enter the process personally, so a big thank you for that. It is about freshly meeting each experience with the knowledge of the patterns but the willingness to let this step outside those patterns. And so, there is a mix. You have a knowledge of familiar patterns which you are able to quickly identify. And that’s very important, because patterns are always a result of the compensatory and cracked identity. But there’s also the willingness to have a completely fresh insight and a completely new experience of that moment where you lay down the pattern, and maybe for the first time, come into contact with the original heart of the moment when you were disproved of, or not appreciated, or rejected. Neil Sattin: So what are some ways that that could manifest? So that if you’re going through this at home, you’re probably wondering like, “All right, what could that look like for me if I’m willing to just be there? It sounds scary.” I have to say, as I was reading your book, I was feeling mixes of elation like, “Wow, this is amazing.” And I felt very viscerally the fear coming up of my parts responding to, “Ooh, that’s gonna be scary when you do that [chuckle], or that could be frightening when you just rest in that with Chloe. Chloe’s my wife. So yeah, it brings up a lot. And you call it the black hole, and I’m sure there’s some good reason behind that. Jett Psaris: [chuckle] Yeah. Well, the black hole is where we really drop into that core sensitivity, and it feels very uncomfortable. And it feels uncomfortable to the compensatory identity which has just failed at its mission to keep you out of that discomfort. That’s the whole idea of the compensation is for you to actually maintain control, feel safe, and feel comfortable. And so, when you drop into these core sensitivities, most of us scramble quickly to get out of them. You know, that’s okay too. What happens is, in my experience, we don’t drop into the black hole in a way that is annihilating. It’s a little bit more like a snake shedding its skin. When we’re ready to drop into the black hole and reveal that piece that’s needing our attention and healing, there really already is a substantial experience of ourselves ready to pick that… Pick something up to, in essence, rises up to carry the day. And so we’re not gonna drop into the hole and go into a self-destruct. It will absolutely feel uncomfortable, and it feels uncomfortable every single time. Jett Psaris: But what happens is, we develop the capacity of making that transition, and the rewards on the other side are… They’re so positively reinforcing, because we get to have that experience of ourselves like when we first fell in love. And so, it is something that happens over time. It’s very helpful if you have a therapist, or a spiritual guide, or close friend to do this work with, because it is helpful to have a kind and gentle holding environment. But over time, you just begin to look for the opportunities to fall into that place and recover the sense of self as infinitely loving, open, generous, kind. And so this work really builds on itself. Jett Psaris: Yeah. I call it the flip. Other traditions call it the spiritual warrior. You develop the commitment to your own unfolding, and you place that over these passing discomforts. At that moment, you have shifted your center of gravity away from a protective, controlling, predictable sense of self and life into a more fluid, more surprising, definitely more spontaneous, and exciting way to be. It’s a little bit like moving from the land which is predictable. We walk on land, it’s predictable, and jumping into water, where there are all kinds of new, and interesting, and exciting, but also scary movements that occur, you’re not in control anymore. Neil Sattin: Yeah. Chloe often… I’ve heard her recount this story of snorkeling in Bali. I think it was Bali. And being right at the edge of this drop-off from… It went from, I think, the coral reef down into who knows how many thousands of feet and just seeing the shadows lurking just below the light and how terrifying that was. Jett Psaris: That’s a wonderful experience. And I often use snorkeling, because most of us when where based in our self concepts, we’re like looking at the surface of the water, and this work you’re putting on some gear and you’re dropping below the surface and there’s an entirely new magical, beautiful world. And so, at some point, we long for our depths and for that magic, and mystery, and largeness, and relationship definitely is the sacred path to that experience. Neil Sattin: I have to say, it was kind of funny to me thinking just now about how so much of our time can be spent trying to avoid conflict, and in that situation that I described with Chloe, we would probably make some agreements that would be around like, “Okay, on Mondays I only work until [6:00] PM,” That sort of thing to avoid… Coming across that circumstance and what I hear you saying is, well that could be great and you get this magnificent opportunity by being in the discomfort of failing or where you’re compensatory strategy is. The things that initially brought you together with that person because you complimented each other so well, where they start to fall apart. Jett Psaris: Yeah, beautifully said. Basically, my way of saying that is, if you can make an agreement and keep the agreement, by all means go ahead and do that. When you make an agreement and you can’t keep them, then you know that you have created false ground between you and that there’s something deeper that’s actually needing to be seen and addressed. And so, when the agreements fall apart which they will, if it’s a repetitive deep issue, then you want to ask yourself, what does the agreement protect you from experiencing? And usually that will be as you said earlier discord, it protects you from experiencing that you’re having a different experience than the other, and we want to protect ourselves from that. Jett Psaris: I think, I encourage all couples to address that question, more kind of maybe in terms of core values which might cover the same area. So, some relationships have a core value of telling the truth as we know it, creating a receptive environment for the truth, becoming conscious of underlying motivations and behaviors, so it depends. It should be born of the specific couple not kind of universal, I think, core agreements, but doing the work of forging those core values in agreements is probably as or more important than when you come up with on your list. It’s saying, this is how I want to be in life with you, and can we agree to that? And if that seems to change, can we speak about what’s changing? Neil Sattin: And it makes me curious to know, like those situations where an agreement is broken, and that could be something like, “I said I was gonna stop working at [5:00] and it turns out I planned an interview for [6:00].” [chuckle] Or it could be something more that feels bigger like a betrayal, an emotional infidelity, an affair, something, I gambled all our money away, like those kinds of things. How do you apply… ’cause what I heard you saying earlier is to help someone realize, “Well, this isn’t about the other person, this is about me.” And how do you merge that in a situation where there’s maybe some shock or trauma going on from an agreement having been violated? Jett Psaris: Well, I’ll been meeting with a couple tomorrow, where it’s a man and a woman. And the man has apparently gambled away their life savings, and she feels deeply betrayed by that. But I have to say that her starting point in asking for the session is that she said, “I recognize that I contributed to the outcome I’m experiencing. I did not take an active role in finances because I was afraid. I knew all along that he had tendencies around gambling, and I didn’t want to look at them. We have two children, I didn’t want that as another issue to have to deal with.” And so, right out of the gate, she’s recognizing that this has to do with her. It doesn’t mean she doesn’t feel betrayed, because she has a pattern, as you talked about earlier, her father also gambled. And so, the narrative is very personal for her, but her starting point is one of taking personal responsibility for what occurred, and wanting to explore what occurred, instead of just making him into a rotten, horrible human being. Jett Psaris: And so, that’s the rigor of this and that can be very hard when we talk about gambling away one’s life savings. It can be very hard when you talk about having an affair. These are the areas that hit us the most deeply in our psyches, and touch into the deepest of our sensitivities and traumas. And they’re the ones that really provide generally the most transformation because they are touching so deeply. So again, the content of what’s occurring is not as important as the commitment and the fidelity to unpacking… I love your phrase “delaminating,” I’ll have to use that. Delaminating these places that we have become hardened and separate from life. Neil Sattin: So now, I’m listening to us and I’m driving in my car, and I’m thinking about this conversation that’s touching down into the core of my essence, and I know it’s there. What can I do in this moment to take a step in that direction of getting clear on where my work lies, and also maybe how to… Well, I understand you’re saying, Jett, that it’s not required, but how might I invite my partner into that with me? Jett Psaris: Well, I think the best invitation is by example. And so, the strongest invitation is this is the way I want to approach what has just transpired between us. I want to look at how I became a part of this narrative with you and how it’s familiar in my own life so that I can be more awake, and conscious, and resourced when things like this occur, and so that we together can create a digestive system that can digest what life brings to us. And so, I think that’s kinda the answer to your second question. The first question is not quite so clear. If you just experienced a betrayal and you just found out about that, the first thing you’re gonna experience is shock. And so, when we experience shock, that is something has come into our field that feels larger than what we can handle. Jett Psaris: And so, the first thing we need to do is not scramble and to actually do the opposite which is very hard to do, which is stop and rest and wait until our warm animal body calms down. And we can walk, we can meditate, we can bathe in warm water, whatever helps us calm our animal body, which always is the one that bears the burden of these shocks. And when we begin to feel like we’re coming out of the shock, then we begin by slowly wondering, what does this situation have to do with me? How is it familiar? And we begin to apply that essential curiosity and interest to what has transpired and recognize that the content of our lives is there to grow the context of our lives, our being, our openness, our resourcefulness, our genius, our capacity to love and care for ourselves and each other. The more we recognize that the content is there to rub us in a way, create a friction to enlarge that context, the more likely we are to use what happens between us, what arises within us, to actually do the work that I’m describing in undefended love. Neil Sattin: And one quick addendum question to that. How do I stop from victimizing myself? I want to inquire, I don’t want to blame myself. Jett Psaris: You don’t want to blame anyone. Jett Psaris: Because this isn’t actually a problem. This is the way transformation occurs. The only way we can see what we can’t see is by bumping into it and suffering the discomfort of it. Jett Psaris: So, we don’t want to become a victim, we don’t want to identify as a victim, we don’t want to victimize others, we want to join together. And it’s all hands on deck, and do what’s necessary to wake up and to use the weather of our lives, that’s what I’m calling the content, the weather of our lives, to see that which the weather is happening in. So, if I have a feeling, I don’t have to become anger, I’m just feeling angry; it’s something that is occurring within me. I don’t have to… If I have a thought, “This isn’t right,” that’s just a thought. That thought is occurring within me, and there’re gonna be thoughts, 60,000 according to Stanford, additional thoughts before the end of the day is up. And so, we become larger than these passing inconveniences or moments of disruption and confusion. Neil Sattin: Yeah. Then you embody it in what you do. We’re not gonna have a chance to talk about it today, but I loved your discussion of needs versus desire versus wants versus desires, and how we progress through that to get to a place where we’re actually good with how life is, which doesn’t mean we don’t desire things. Neil Sattin: Well, Jett Psaris, thank you so much for joining us today. It’s been a pleasure. I could talk to you for another hour I’m sure, but your tree crew showed up. Neil Sattin: And I’m just so delighted to have you here. Jett is, as we mentioned the co-author of “Undefended Love” along with her partner Marlena Lyons. And you can get links to her websites through the show guide for this episode. Again, you can visit neilsattin.com/undefended, or text the word “Passion” to the number 33444 and follow the instructions. Neil Sattin: Jett, is there anything else currently going on in your life or your world that you’d like to tell people about? Or if they want to find out more about you, where should they go? Jett Psaris: Oh yeah, my website is http://www.jettpsaris.com. And I just published a new book this year which I’m very excited about, “Hidden Blessings: Midlife Crisis As a Spiritual Awakening”, that has won a couple of awards already. And for those in midlife, over the age of 40, that might me something if you like this approach, basically. It’s an undefended approach to the midlife passage which I believe is arguably the most transformative passage of one’s lifetime. So, do take a look at that, if this approach is of interest you. Jett Psaris: Thank you so much. I appreciate you and the work you’re doing.